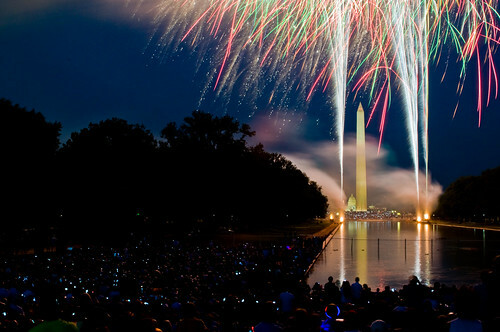 So You Want to See the National Fireworks on the Mall? 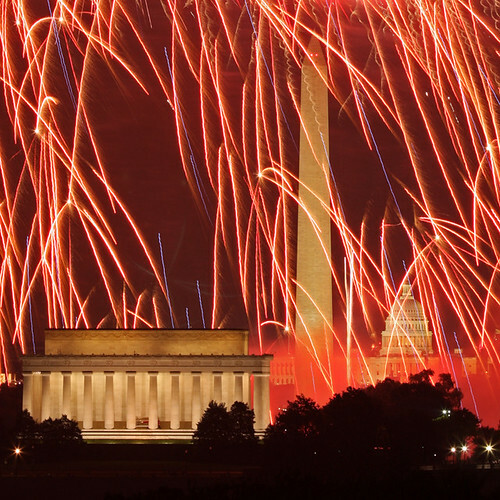 So you want to see the National Fireworks on the Mall? 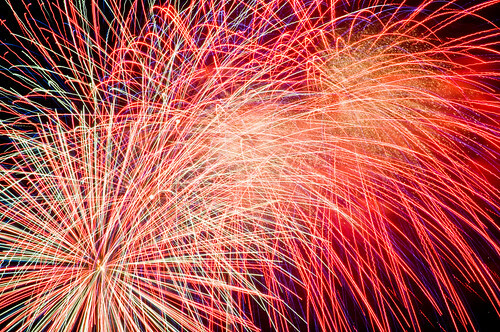 But you’ve heard all this about talk about crushing crowds, insane Metro rides home, and a constant threat of rain just before the fireworks are supposed to fly. Yeah, that all happens. But I can help with alternatives and easy to handle ways of dealing with the above problems. 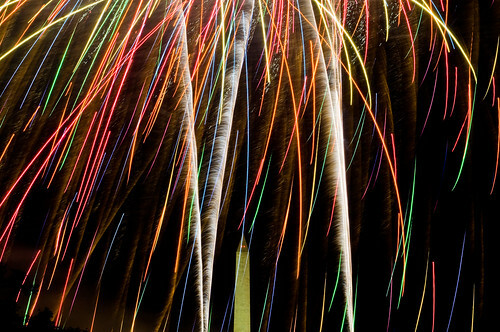 Because, really, the fireworks on the Mall are one of the great things about living in this city and everyone should enjoy them. I’ll go over locations, best ways of getting home, and even a short gallery of pictures. 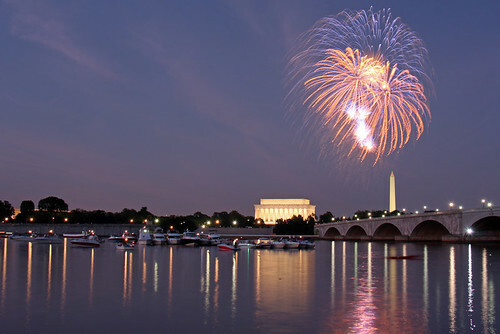 If you want info on security checkpoints to get onto the Mall, and any other info, check out the Park Service’s page on the fireworks. 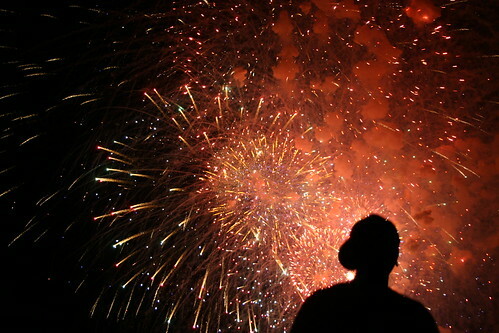 The first thing to decide on is where you want to see the fireworks. 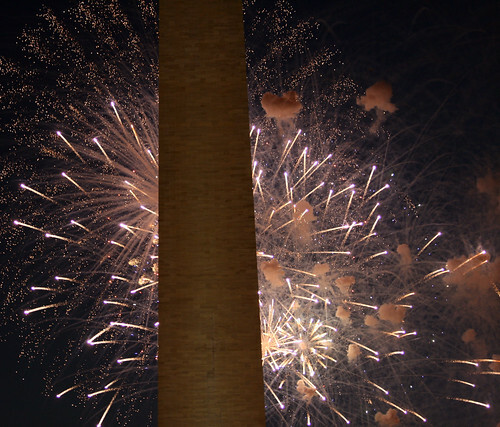 The obvious spot is the foot of the Washington Monument, front and center. It’s a great spot for the fireworks, but getting there is difficult because this is where everyone thinks to go. And, unless you get there early, it gets packed. If you go to this spot, I would recommend trying to get there no later than 5pm. The next location is at the foot of the Lincoln Memorial (such as the above shot). In years past, it’s actually quite nice. But with the Reflecting Pool undergoing renovations, it’s not quite the same. Still, this location will have slightly fewer people than the Washington Monument, and a good view. I was there last year, and I could easily have gotten there by 7pm and gotten a decent spot. Let’s move across the Potomac for the next shot. In Rosslyn, just south of the Iwo Jima Memorial, is one of the best vistas of the city at the Netherlands Carillon. From here, the monuments line up, you get reflections on the river, and you can just take in the city while it gets lit up by the fireworks. It’s a popular spot for people (I believe it’s mainly locals), so you still will want to get there early. And you’ll have the Park Service security checkpoints to go through. I’d say sometime between 6-7pm and you’ll be fine. Next spot is more “in the know.” And that is along the Mount Vernon Trail. This spot is great because there will be fewer people, a ton of real estate to find a spot, and many different views. You can be up next to Roosevelt Island, or you can be either north or south of the Memorial Bridge. You can almost certainly get there by 9pm and find a comfortable spot. This is actually where I will be going for the fireworks, so if you see me, be sure to say hi! There are, of course, more spots to watch the show from a distance. I’ve heard Meridian Hill/Malcolm X Park and the National Cathedral, both on commanding hills in the city, are great places to watch. Further afield, Gravelly Point next to National Airport and the Air Force Memorial, sitting just above the Pentagon, are good, but distant, spots to see the show. And there are also many building rooftops with good views. If you have any inside info on spot, be sure to share in the comments. The best thing you can do if you’re going anywhere near the Mall on the Fourth is to wear your walking shoes. This is because walking is the best way to avoid lines and needless waiting. Especially at the security checkpoints. In fact, if I impart anything useful in this article it will be this: use all the screeners at the checkpoints!!! Every year I see lines form for the corner screening tables, and the middle tables have no one at them. Please, walk a few extra feet and you will be through the security lines much quicker. If we have to deal with this security theater, can we at least deal with it quickly and smartly? 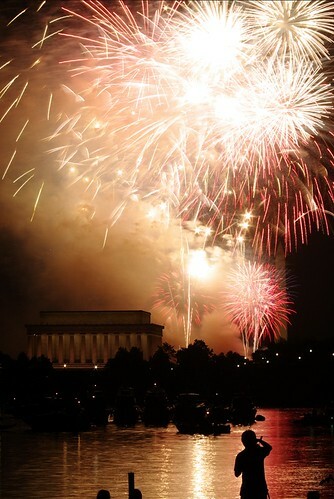 Also, realize this now: Metro will be packed, especially right after the fireworks. You are not the only person going home; there will be thousands of other people. So, seriously think about either: 1) walking three or more stations down the line, or 2) find a nice bar, restaurant, or friend’s house to wait out the crowds for an hour or three. One year, I decided to walk from the Mall to my apartment in Glover Park. I can assure you I beat everyone else home. There is no avoiding this; you will either be in a cheek to jowl mob that is waiting or you will be waiting some other way. You get to decide. 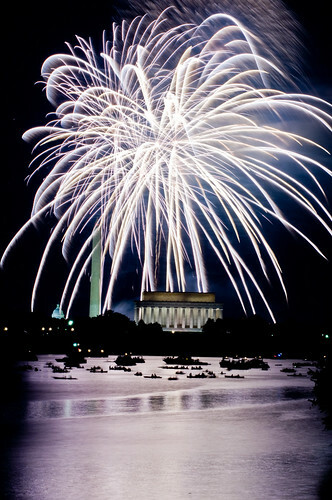 Remember, Smithsonian Station is normally closed on the Fourth. Also, all the major stations get packed quick; Metro Center, L’Enfant Plaza, Chinatown, they all become zoos. And avoid transferring, because it will only give you a headache; walk to the line that will get you home directly. And take my advice: walking down the line will clear out some of the trains with the heaviest loads and you’ll actually be able to get on a train. Finally, remember, this is a birthday. 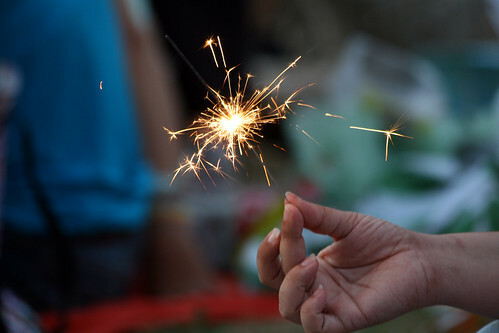 The 235th birthday of our country. 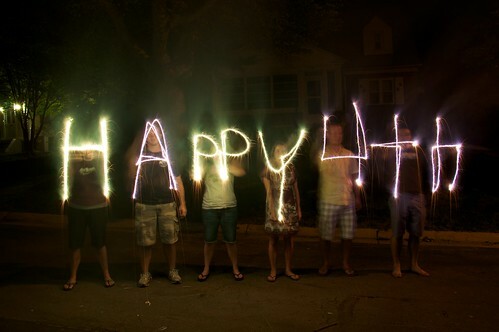 So have fun, be safe, and enjoy the show! 2 years ago I was at the Tidal Basin near the FDR memorial and the views were fantastic, with very little crowding. I’m not sure why more people weren’t there due to its proximity to the mall but it was a great spot. DC or Virginia….? 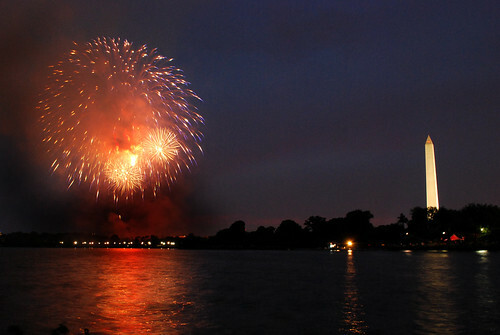 You can split the difference and catch a pretty good view from either the Key Bridge or Memorial Bridge. You won’t have as easy a time camping out, but then again, the show only lasts for 20 or 30 minutes anyways. 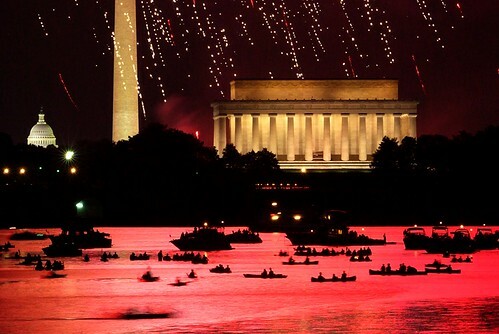 I have a good friend who will be hopping in one of the Jack’s boathouse canoes/kayaks and watching the fireworks from the water. Mt. Vernon Trail here I come! Mt. Vernon Trail is an excellent suggestion. Letting the crowds disperse by going to a bar for an hour or so is also a good idea. Great photos! @Jack: I think the Tidal Basin isn’t more crowded because it’s a lengthy process to get there and get away. You have to go around the Mall and then around the Tidal Basin. But I think I might try it out next year; thanks for the idea! @Bilsko: That’s an idea that always comes up, and I’ve thought about it. 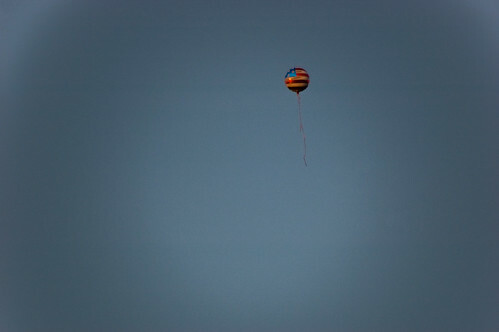 My issue with it is two fold: 1) it’s really far away, and I like to hear the fireworks as much as see them. And 2) most of my suggestions are based on taking pics of the fireworks, and a bridge is a very unsteady platform, by design. So it’s not ideal for long exposures. But still, something to consider in another year. @Eric and Joe: Thanks! Hope to see you both out there! One year a while back I was a summer hire with the Park Service working on the Mall. My regular assignment was running the elevator in the Washington Monument, but since that is closed on the 4th, I was assigned to the Lincoln Memorial steps. As the evening came on, I was lucky enough to be sent to the roof of the Lincoln Memorial with a couple other Park Service types, escorting a handful of photographers. It was the most incredible place to see the fireworks, not to mention seeing the very behind-the-scenes parts of the Memorial. The only better place I can imagine to see the fireworks would be the Truman Balcony, but no luck yet getting a seat there!